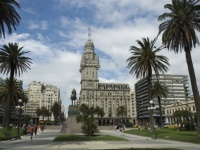 Montevideo's showpiece plaza contains some of the city's most impressive architecture, including its best-known landmark, the Palacio Salvo. Designed by Italian architect, Mario Palanti, and completed in 1927 or 1928, it was originally intended as a hotel. It has never fulfilled that purpose. Instead, it is home to an elaborate collection of offices and residential apartments. Once the tallest building in South America, it was built on the site where Gerardo Matos Rodriguez wrote La Cumparsita: one of the most famous and recognisable tangos of all time. The Plaza also contains a statue of Uruguay's national hero, General Artigas.